Nearly any movement you need to perform in life is either based on one of these patterns or a combination of them. If you lack the ability to perform them well, you’ll naturally find ways to compensate. Compensation patterns force stronger muscle groups or joints to pick up the slack for the weaker and/or limited ones. This can lead to overuse, trigger points and joint disease. We approach the members limitations from a variety of ways over the months, but our objective is always to improve the quality of their movement. Meaning, we want to see beautifully controlled movement through a non-painful range of motion. Over time we increase range, volume, weight, tempo...without ever sacrificing quality and safety. We do this with a mind on science and an eye for art. When you look at our programs, you’ll see we try to hit the spectrum in the strength curve. Some things are light, fast for many reps...others are heavy, slow for a few reps. 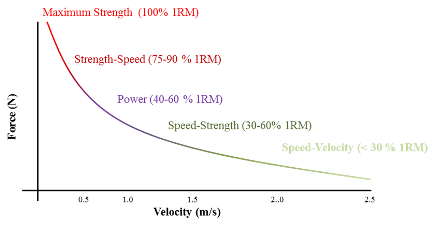 In order to develop the different aspects of the strength curve you'll need to use different percentages of your max weight. In reality, you'll never know the true 1 rep max for most of the exercises you and your clients use. For now, just understand that when you're training close to your max weight you'll only get a few reps and they'll be slow, when developing speed you'll need a lighter weight that you can hit for numerous reps.
We strive for well rounded athleticism by including agility, power, near maximal strength and endurance. I’ll also point out two other attributes in the programs. Training through all 3 planes of motion We don’t go crazy with this, but it helps if people get exercises that develop strength and stability through all planes. It’s good for performance and injury prevention. Because of modern lifestyles, most people have forward rounded shoulders and are hyper-kyphotic. This is due to driving, computers and cell phones...not to mention that most people who exercise often do more horizontal pushing than horizontal pulling, which further exagerates the imbalances. We counter this, and in turn greatly improve postures and return height, by having more horizontal pulling than pushing volume. We aim between a 3/2 or 2/1 ratio. Where is the equipment stationed? When you pair exercises together, will the sequence flow nicely or will your clients be walking back and forth constantly? Write out and be prepared to demonstrate 3 exercise variations that fit each of the following categories. Feel free to use the Google machine.